I recently started a series on my other blog about different ladies I love, because women need to support other women and share their stories. Now, I’m going to do the same here about amazing geek goddesses who make me fangirl at their accomplishments and awesome awesomeness, and I start this series with the one and only Felicia Day. Ms. Felicia Day is, quite simple, a queen of the internet. She is the founder of Geek and Sundry, a website and community for all people who love anything geek and have an independent spirit. She is also an actor, comedian, and writer. She starred as Vi in Buffy the Vampire Slayer, Dr. Holly Marten in Eureka, Charlie in Supernatural, and Penny in Dr. Horrible’s Sing-A-Long Blog. Her multi-talented-ness doesn’t end there! She also stars, writes for and produces the online web series The Guild, which is loosely based on her life as a video gamer. She began college at the age of 16, and graduated with degrees in Math and Music Performance (she is an accomplished violinist too). She moved to LA, where she began her full-time acting career and gained much fame in the geek community. She recently published her memoir You’re Never Weird On The Internet (Almost), which is a New York Times Bestseller. She has also helped campaign for Stomp Out Bullying by creating a fundraiser of T-shirts (seen below and here). Why I love Felicia: she stands for being herself without fear and shame and believes everyone should have that, she is a boss lady and made her own content creation company (Geek and Sundry), and is an incredible role model for going after your dreams and being yourself while doing it. 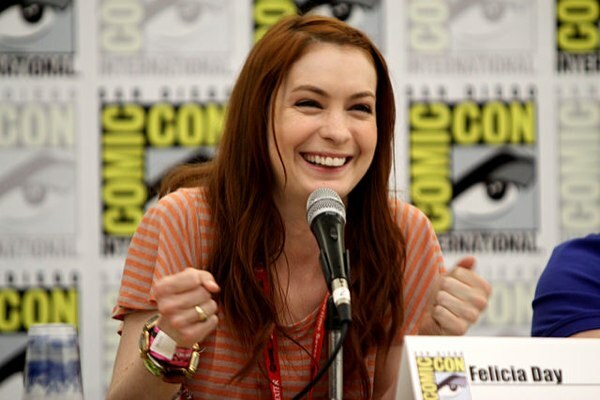 So I am a fangirl of Felicia Day, and you should be too! My other half has a massive crush on her so I was MADE to watch her. I soon fell in love too – she’s awesome and so is her Flog! Yes, I love the idea of this series! And Felicia is a great woman to kick things off with. I used to be a part of a blog called PaperDroids and they have a monthly segment called Awesome Ladies in History where we’d just write about a significant woman in history. Fun! I have never head of her. *hands over geek card* Sorry. But she seems pretty fun and awesome. LOVE her! 😀 I watched the guild and also a lot of her newer skits. She’s so talented. I need to read her book still! You have to read it!! It’s really good!! !